What Does Code P0707 Mean? OBD II fault code P0707 is a generic code that is defined as “Transmission range (TR) sensor/switch -low input”, and is set when the PCM (Powertrain Control Module) detects an input voltage from the transmission range sensor or its control/signal circuit(s) that falls below a minimum allowable threshold or limit. Also known as the “PRNDL input” and/or “neutral safety switch”, the purpose of the transmission range sensor is to provide input data to the TCM (Transmission Control Module) and the PCM about which gear is currently selected. If the transmission range sensor is fully functional, it also acts as a safety cut-out switch that allows the engine to be started only when “N” is selected. In terms of its operating principles, the transmission range sensor is typically a rotary type switch similar to an ignition switch in which different circuits are completed depending on the position of the moving part(s) in the switch. In the case of most transmission range switches, the transmission selector shaft passes through the switch; thus, by moving the gear selector, the selector shaft rotates a moving part, which then completes a particular circuit- with the circuit depending on the position of the gear selector. In practical terms, if the gear selector is moved into, say, the “D” position, the transmission range sensor will complete a particular circuit that alerts the PCM, TCM, and other control modules that “D” had been selected. Apart from illuminating or highlighting the appropriate indicator light on the dashboard, completing this circuit when “D” is associated with different modes like “Sport”, “Economy” or others, also allows both the PCM and TCM to switch to a programming mode that is appropriate for the particular mode that was selected. From the above it should be obvious that the transmission range sensor/switch is a critical component and that if it fails or cannot communicate with the PCM/TCM effectively, these control modules cannot in their turn, manage the engine and transmission effectively. For this reason, when the PCM/TCM detect abnormal voltages in either the transmission range sensor or its control/signal circuits, the PCM will initiate a failsafe or limp mode both as a safety precaution, and to prevent damage to the transmission. NOTE: Note that some types of failures will not necessarily cause a failsafe or limp mode: for example, if circuit that indicates “N” fails the engine may be started while any gear is selected. While this condition is clearly dangerous, it does not affect the operation of either the engine or transmission directly, and a failsafe or limp mode will therefore not be initiated. Be aware that on most applications, the presence of only code P0707 will generally not cause the CHECK ENGINE warning light to be illuminated. However, what might happen is that the “OD” (Over drive) or other transmission related indicator light may start to blink or flash. Where is the P0707 sensor located? The image above shows a typical transmission range sensor (indicated by the white arrow), where it is attached directly to the transmission casing. 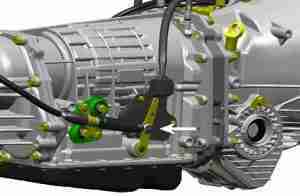 While his arrangement is typical, there are nevertheless applications on which the transmission range sensor is attached to the gear selector lever. On these applications, the transmission range sensor is typically located inside the center console where the gear selector lever acts upon it directly, instead of through a control cable as shown here. What are the common causes of code P0707 ?